While the cake is cooling, beat the butter in a large bowl or the bowl of a stand mixer, until light and fluffy. Add the vanilla, cocoa powder, and powdered sugar, and mix until smooth. Add just enough milk to make a smooth, creamy frosting. Spread the frosting over the cooled cake. 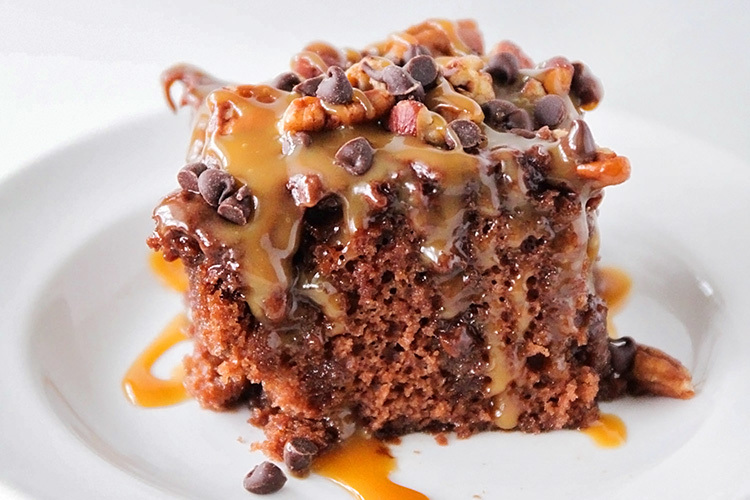 Drizzle with the remaining caramel sauce, and sprinkle with the mini chocolate chips and pecans.